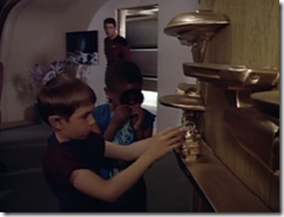 This blog post continues on from the previous one, where I began picking apart all the things that bothered me about the final episode of Voyager. Again, I remind you that this is spoiler heavy! There’s more preamble in that post, so without further ado, let’s get on with it! Oh, the Borg. The Borg, the Borg, the Borg. The Borg are a terrific villain, but that is sort of the problem. They had to be defeated back in TNG because with their rapid adaptation, it was pretty clear that they would overrun the Alpha Quadrant in very short order. This was continued in Voyager as they became a legitimate threat again, but had to be defeated regularly by a ship even smaller than the Enterprise-D. 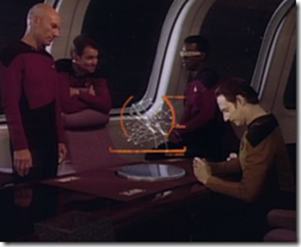 Within this final episode, it was revealed that the Borg were scanning the armour upgrades to the ship and attempting to adapt around them. 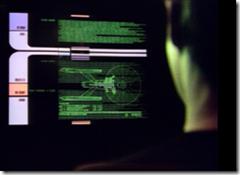 Simply by installing those upgrades and encountering the Borg, Janeway has given them an opportunity to advance twenty years ahead of where they should be – if they disseminated that armour data as widely as they could as soon as it was received then it is conceivable that by the time that armour should be developed by Starfleet, the Borg will be able to negate its usefulness. If the Federation ignore the temporal prime directive and research the hell out of that future technology, they will be able to maintain the status quo against the Borg. However, the other Alpha Quadrant races would not be so lucky. With all of them weakened from the Dominion war, and the Borg already as far back as Picard’s golden age rampaging across the neutral zone, the Borg would have armour technology far surpassing that of any contemporary weapons to penetrate. Unless the Federation share that armour technology with allies like the Klingons (two civil wars in the last fifteen years? ), the Romulans (at least two coups in the few years following Voyager’s return) and the Cardassians (two major wars with the Federation in the last fifteen years), the Alpha Quadrant will fall to the Borg. How long it will take the Borg to take advantage of this is unknown, however, with one of their transwarp hubs destroyed. There are only six in the galaxy – which means that in exchange for giving them a glimpse at powerful future technology, Voyager has reduced the Borg’s mobility by (charitably) around 20%. They also killed the Borg Queen… but this isn’t really a major drawback for the Borg. There’s no indication of how many Queens there are or how important she really is to the Borg. 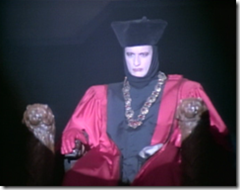 Just a few years before Voyager got home, Picard killed the Queen three centuries in the past. I can’t remember for certain, but I had a feeling that Janeway has already killed the Queen once before. She is a remarkably resilient creature. 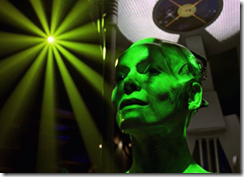 If the “Borg Invasion 4-D” interactive ride can be taken as canon, then a few years after Voyager returns home the Queen is back and the Borg are functioning as normal again. So whatever blow they struck against the Borg is effectively removed by the Borg’s ability to operate as a collective mind, and their ability to regenerate or recreate an immortal Queen to lead them. 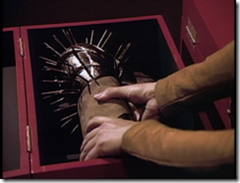 This is mostly conjecture, however – there always seems to be more to the Borg than appears and this is the only explanation for why they don’t do the logical things or behave in a manner consistent with Starfleet’s understanding of them. Admiral Janeway broke the temporal prime directive by giving future technology and knowledge to her past self. She freely dispenses these nuggets of knowledge to anyone who will listen to try and get a mutinous crew to force Captain Janeway into accepting her help, and validating the Admiral’s decision to effectively end her career and life. Captain Janeway would not necessarily be viewed as a hero by accepting these gifts, however freely given. It sets a precedent where anyone with time travel ability (a relatively common technology as soon as thirty years after these events) will be pardoned for sending hints, knowledge and technology backwards and altering their own timeline. 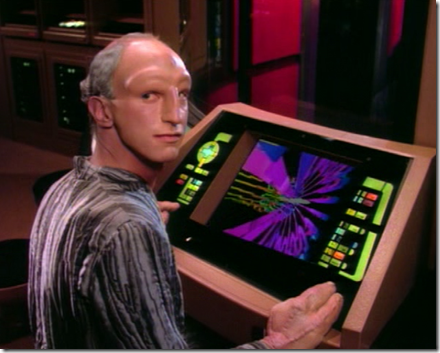 In the case of Voyager, this has already been foreshadowed as Harry Kim in an alternate future uses Seven of Nine’s temporal node to send data back in time and save them all from crashing on a frozen planet. Captain La Forge in that alternate future was attempting to stop him, by any means necessary, because of the temporal prime directive. 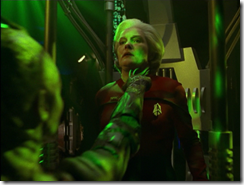 Admiral Janeway’s violation is far worse – she is providing more than small packets of situational data (ie, useless outside of their one small context) and the needs are far less. She stated that less than twenty crew will die in the following sixteen years, whereas Harry was attempting to save the entire crew and the ship itself. If Captain Janeway hadn’t accepted the Admiral’s help, they’d have made it home and with almost the whole crew intact. If they were going back in time to bring Voyager home early, why not go back to Deep Space Nine and prevent them going on the mission to the Badlands in the first place? The violation of the temporal prime directive was more trouble for less gain than Harry Kim’s violation, and Starfleet attempted to stop him from succeeding. I don’t see why they would allow Admiral Janeway’s, and Captain Janeway’s complicity in it, just because it’s easier to beg forgiveness than ask permission. Which brings me to a fun mental game I like to play – how would the other modern captains have played it? Sisko is a lot like Janeway – he’s shown that he’s willing and able to break rules if it’s required in order to do the most good. He also has almost as big a beef with the Borg as Janeway has, so the chances are that he too would try to cripple them first and use them second, and go along with the Admiral’s plan as long as he can do it on his own terms (and deal a blow to the Borg as they leave). Picard on the other hand hasn’t been through quite the same experiences as the other captains – he rarely steps off the Starfleet mark, and is the ideal that Janeway holds herself to. Sisko had a sense of duty and responsibility, but reconciled it against a duty and responsibility to his family and to Bajor. Picard and Janeway have never appeared to think of a life after Starfleet – they will die at warp speed, on some alien planet. 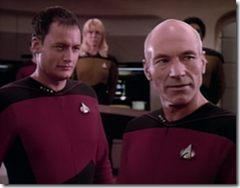 Picard’s duty would not let him violate the temporal prime directive in almost any situation – he would be disgusted most of all if the Admiral returning from the future was himself, and likely to abandon the plan on that principle alone. However, he does have one weakness… The Borg. It’s entirely possible that his obsession with the Borg wasn’t tempered at all by his victory in First Contact, and the presumed subsequent encounters in the Delta Quadrant would only have hardened his heart further. I can foresee an episode where he refuses to use the Borg technology for his own good but takes the future weapons to destroy the transwarp hub, sitting in the nebula and watching every last particle burn. He would ensure it was gone, and every trace of it wiped out. No salvage, no escape. In this, he is unlikely to listen to cries for mercy from his senior staff despite any lessons learned after First Contact. Sisko would have done exactly what Janeway did, and Picard would either tell his future self to jog on, or destroy the Borg and then tell his future self to jog on. Since Voyager got home but nothing of the last seven years was resolved, what was the point? Aside from the cameo that the (non-time travelling) Admiral Janeway had in Star Trek: Nemesis, nothing in the Star Trek universe has changed at all. Apart from Janeway’s promotion, all the characters still exist in the same state that they did in the previous episode – sitting on Voyager, regardless of their status as wanted criminals. 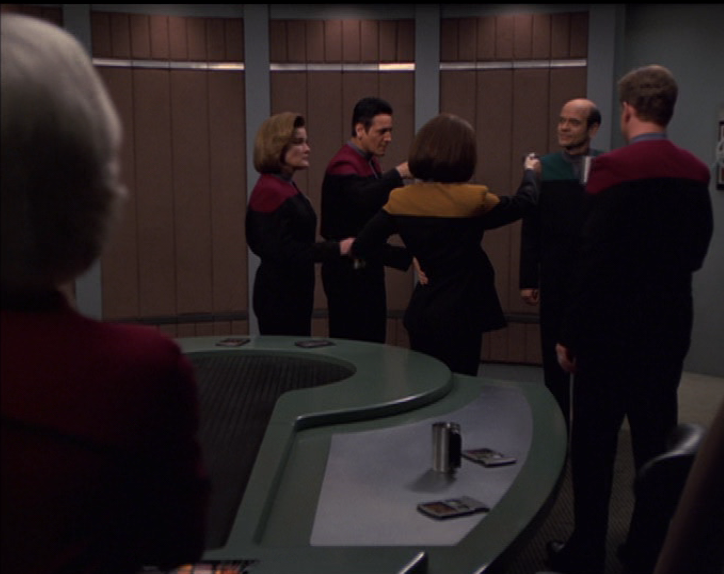 With the scene earlier, where Admiral Janeway watches the crew talk about how it doesn’t matter if they miss this chance, they’ll find others, they’ll get home eventually, and toast the journey it wouldn’t be out of place if they just took the technology and launched an assault on the Borg, leaving the path open for a Voyager film to get them home early, or advance the Voyager plot on the big screen. 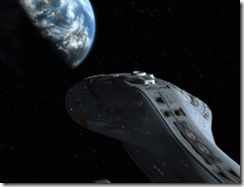 If Voyager hadn’t have made it home in this final episode, there are no consequences. We have a view of a possible future (Seven marrying Chakotay and dying in three years, Tuvok’s degenerative illness eventually limiting his mental faculties) but with knowledge of the future comes the ability to change it. Overall, it was a great episode (like much of the last season) with a good plot, but it just feels like they could have done with an extra half-hour or so to increase the time taken to convince young Janeway, to explain just how devastating the infection attack on the Borg was (outside of the transwarp explosions) and to give each character a couple of minutes to wrap up their story and how they plan to move on with their life, or how Starfleet plan to deal with them. 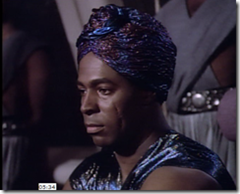 Maybe I’ve just been spoiled by Babylon 5 – when that was wrapped up, there were a few episodes showing what came next. One was a series of short scenes showing snapshots of the far future, and the effect of the overall plotline on Earth and the galaxy centuries from now. That’s obviously a bit too much for Voyager, but the character stories could all be wrapped up nicely. Thanks for reading! I’d like to know what you think, or if you disagree with any of my points here, or even if I’ve missed anything that you’ve always been thinking about! 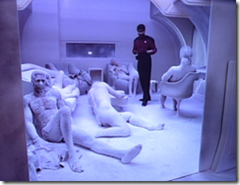 I’ve had an idea for a while of reviewing and discussing Star Trek episodes. The original plan was that I would review the episodes in order, and go back to the beginning of The Next Generation and start from there. But we’ve been watching through every episode so far and just finished watching Voyager, and I had a lot in my head about the final episode so it looks like I’ll be starting there. Just to warn everyone, there will be a lot of spoilers here. Consider this a sort of “spoiler warning”. I found that while writing it, I had so much to say that it’s worth splitting into two blog posts. The next one will be up in a fortnight! Just to be clear, this isn’t an autopsy related to the first episode of this two-parter – just the first part of my autopsy of both parts considered as a single episode. If that didn’t clear it up, I’m sure you’ll see what I mean further down. I liked the last episode, but I found a lot of problems with it. The biggest one is this: Why did they get home at all? We see a lot of an alternate future where Voyager spent another decade in the Delta Quadrant, learned a lot and grew a lot. In contrast, we see absolutely nothing – literally, nothing – of the consequences of them getting home. Deep Space Nine never had a seven-year quest like Voyager, yet we know where the characters went and what they are doing next. There’s definite closure in the end of it. Voyager felt much more like the end of The Next Generation where the final episode didn’t really mark the end of anything and life will continue as it always did (and see the movies for the proof). The only consequence as far as I can see is that Janeway is promoted to Admiral before the events of Nemesis, and there is an implication that Tuvok will not suffer from his degenerative brain disease. Neither of these are shown in the episode, they spend less than 5 minutes in the Alpha Quadrant and we see them fly towards Earth, but not actually meet with or have physical contact with anyone in the Alpha Quadrant. I had a few questions that weren’t answered here that I’ve spent seven years (figuratively) thinking about. Granted, the Maquis subplot was dropped fairly quickly. The tensions were mostly stirred up in early episodes by Seska and Torres, but with Seska leaving and Torres calmed down and resigned to her fate on Voyager the rest of the Maquis just seemed to toe the line. 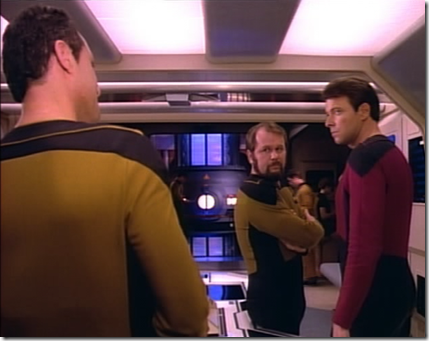 It flared up once or twice since – Lon Suder’s inability to integrate in Year of Hell and the “misfit” crew members in the final years are notable examples – but for the most part they integrate as good little Starfleet officers. Unfortunately, this integration is out of necessity. The only mention that I can remember being made of the consequences of getting home for the Maquis occurs in the first season, and no doubt if they’d gotten home at any point in the first two years Janeway would have them all locked up for their terrorist activities. 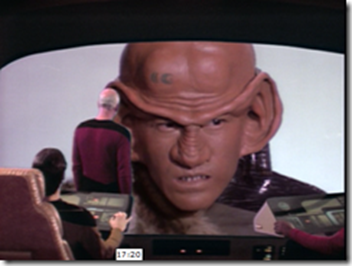 Now that they are home, what happens to the Maquis crew? They won’t be allowed to continue serving on a Starfleet vessel without at the bare minimum re-enlisting in Starfleet (for Chakotay this would be trivial, for Torres it might involve a quick graduation in the Academy) and, let’s not forget, going on trial for their crimes. The Maquis are terrorists in the eyes of Starfleet and although the Maquis as an organisation no longer exists (the Dominion wiped them all out), why would any bombings, raids, thefts or attacks committed by the Maquis against Starfleet or Cardassian targets (who were not at war at the time) be ignored just because their ship went missing? 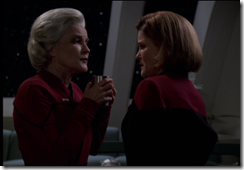 In some ways, Janeway has still successfully completed the mission she set out on seven years previously – to bring back the crew of the Batanay for trial. 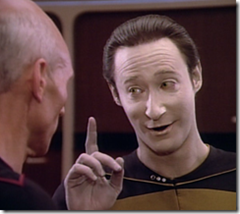 Will all the crew want to enlist in Starfleet? Stockholm syndrome aside, many were effectively at war with Starfleet before they were lost in the Delta Quadrant and will see no reason to ally with them in the Alpha Quadrant. Some probably never integrated pleasantly with the crew at any rate – see Chell, Lefler, Mortimor etc in their brief moments of belligerence and discontent. Would they see the Maquis as finished, or does the cause still exist for them? The Maquis was only destroyed in the Alpha Quadrant, and although they are small in number there may be enough strong-headed rabble-rousers amongst the Voyager crew to recruit more people. I don’t believe that the cause was destroyed with the people. The original cause of the Maquis was that the Federation granted planets to the Cardassians, and evicted the human populations to do so. 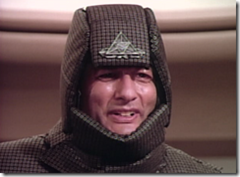 Given that the Cardassians (as part of the Dominion) have been invading and taking over planets during the war (probably not all of which were recaptured), are there now more dispossessed peoples ready to join a new Maquis, even though the original displaced rebels were killed by the Dominion? Assuming that they don’t immediately try to run off and rebuild the Maquis to pick a fight with the severely weakened Cardassians, I can imagine that seven years of good service on Voyager would be a point in their favour. Sentences would be reduced, waived in some cases, all dependant on what crimes they may have committed prior to being lost in the Delta Quadrant. In a way I’m glad that Chakotay’s story wasn’t resolved – the most realistic thing to happen for Seven would be to dump him. A romantic relationship that only existed for a few weeks isn’t going to last if he’s being sent to prison for an unspecified time (although longer than if he’d been tried by the Cardassians). But this is television, and without the requirement to show that relationship waiting for the time they can be together again, the general rule is that LOVE CONQUERS ALL and she will wait for him, even if he is imprisoned for years. The Doctor’s story also couldn’t be resolved just by coming to Earth. He is an outspoken and occasionally misguided activist for holographic rights, and nothing about that story changes just because he comes back to Earth. Even moving the focus to him and his story would probably be some expectation on his part that on returning home, new laws will be passed to give him the rights and respect under law that he’s come to expect on Voyager. That’s still a story idea triggered by the return home that won’t become an issue until at least a week or so has passed. Not a lot here, but how gutted is Neelix going to be that he jumped ship just a week before they got back to Earth! Icheb too isn’t seen in the “default” future. We know that he cannot find his home, and presumably any home, as he was created to be a weapon against the Borg and even his family were going to sacrifice him for the second time. What did he end up doing on Earth at the end of the episode? I know he’s a relatively recent addition to the crew, but he was still a relatively important character and some closure on his story would be nice. 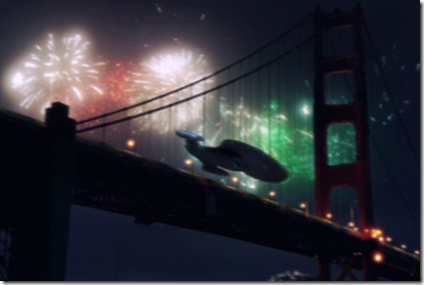 Of all the different things that going home meant resolving, the fact that Harry Kim was always the first in any episode to start planning the following morning on Earth whenever they found a piece of technology, a spatial rift or stellar phenomenon that may be able to shave a week or more off of their journey. The one thing that shows that they got home would have been a shot of Harry Kim contacting his parents, or at the very least shedding a tear of joy on the bridge because every third episode since they got stranded in the Delta Quadrant, he has been thinking of Earth. Many of the rest of the main crew were ambivalent at best at returning home – Tom, B’elanna, the Doctor, Seven, Neelix, Icheb – none of them have shown any strong ties to home or gotten too excited about the possibility of getting home. But Harry, really, has been harping on about seeing his parents for seven years. It doesn’t feel like they got home unless he actually gets to see them. On the other hand, it’s so obvious what Harry wants and what he’ll do that it doesn’t really need to be shown. We all know who he’ll go to first, and what he’ll do, and how he’ll go straight back to Starfleet for duty as soon as he’s done. That’s enough! Over 1300 words to get started. Next time, I’ve got a bunch more to say about this final episode.